Fiendly 11" King Doggy Kisses is patterned after Todd Parr's own three dogs. They live with the award winning children's author in San Francisco. 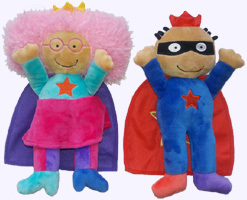 King Doggy Kisses sports a golden crown and a removable red cape with a heart applique'. Safe for all ages. 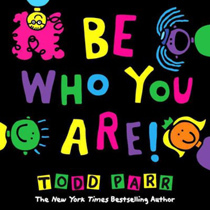 Todd Parr encourags kids to try new things, experiment, and dare to explore new paths. From coloring outside the lines and creating a unique piece of art to forgetting an umbrella but making a new friend, each page offers a kid-friendly take on the importance of taking chances, trying new things, and embracing life, mistakes and all. Hardcover. Author Todd Parr. Loveable puppy with irresistible charm comes from Todd Parr's kid-friendly illustrations in Doggy Kisses. 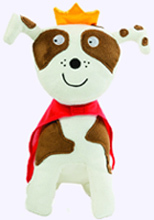 6" sitting puppy comes in soft velour with embroidered facial features and a heart applique on its cape. Safe for all ages. Machine washable. Quirky bold animals inspired by Todd Parr's kid-friendly book illustrations come to life in soft-velour with embroidered facial features and removable underwear for extra play fun. Pig and Chick Animals are 6" tall. 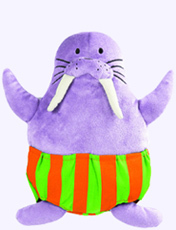 Walrus is 11" tall. Safe for all ages. Machine washable. From alligator to zebra - with a goldfish, iguana, yak, and even a unicorn in between - there's no better way to learn the alphabet than with animals... in underwear! Todd Parr's signature kid-friendly illustrations and bold colors showcase an array of animals in all kinds of hilarious underwear styles, making learning the alphabet tons of fun. Padded Board Book. Author Todd Parr. Ages 2 - 4. Plush Dolls are 10" tall. The boy is dressed in a blue velour jumpsuit and has a red cape. On the back of his cape "Be Who You Are!" is embroidered on a yellow star. The girl has a deep pink skirt, an aqua blouse and a purple cape. 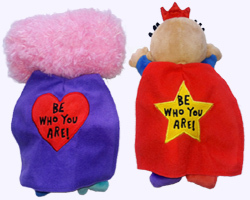 On the back of her cape "Be Who You Are!" is embroidered on a red heart. Be Who You Are! Plush Boy Doll. Be Who You Are! Plush Girl Doll. 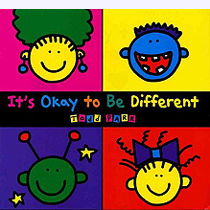 In a brand-new companion to his beloved classic It's Okay to Be Different, author Todd Parr encourages kids to be proud of who they are inside. Be who you are! Be proud of where you're from. Be a different color. Speak your language. Wear everything you need to be you. Who better than Todd Parr to remind kids that their unique traits are what make them so special? With his signature silly and accessible style, Parr encourages readers to embrace all their unique qualities. Hardcover. Ages 4 - 6.